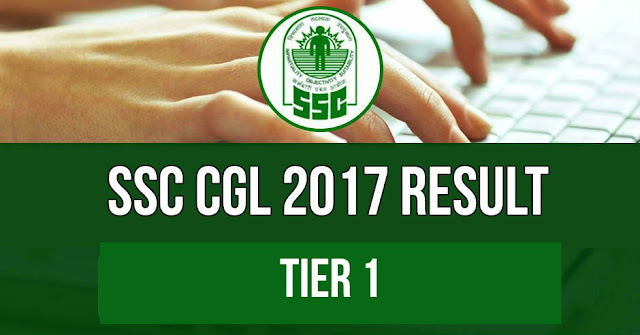 Staff Selection Commission (SSC) has declared the result of Combined Graduate Level (CGL) Examination (CGLE) result on 30th October 2017. The Staff Selection Commission conducted the Combined Graduate Level Examination (Tier-I)-2017 in Computer Based Mode. The Examinations were conducted from 05th to 24th August 2017 at various Centres all over the country. 15,43,418 candidates appeared in the said Examination. * In addition to the UR candidates shown above, 1953-OBC, 256-SC, 57-ST, 9-OH candidates are provisionally qualifying at UR Cut-off. Only candidates who had applied/possess EQ for the post of A.A.O. have been considered for Paper-IV. * In addition to the UR candidates shown above, 1376-OBC, 153-SC, 37ST, 7-Ex-servicemen, 5-OH, 1-VH candidates are provisionally qualifying at UR Cut-off. Only candidates who had applied/possess EQ for the post of J.S.O. have been considered for Paper-III. (i) 15 candidates have appeared in the examination twice. (ii) 47 candidates already debarred by the Commission for use of unfair means have also appeared in this examination. The result of these 62 candidates has not been processed. List of the 62 candidates has been placed on the website of the Commission. 7. Candidates belonging to reserved categories for whom certain percentage of vacancies are reserved, as per the policy of the Government must contact the respective Regional Offices of the Commission immediately if they do not belong to the category shown against their Roll numbers. 8. The Combined Graduate Level (Tier-II & Tier-III) Examination, 2017 is tentatively scheduled to be held from 21.12.2017 to 24.12.2017. The Admission Certificate of the Qualified candidates will be uploaded on the websites of the respective Regional Offices approximately 10 days before the conduct of the Tier-II/III Exams. However, the candidates who are unable to download their Admit Cards may contact the concerned Regional Offices at least 7 days before the commencement of the examination. The responsibility of ensuring the download of the Admit Cards is solely of the candidates. 9. Marks of the qualified/non-qualified candidates of Tier-I will be uploaded shortly on the Commission’s website http://ssc.nic.in.